Recently, I had to read a book by a very smart woman by the name of Susan Sontag. Passionate about her work as a photographer and empathetic to the people around, she felt compelled to write Regarding the Pain of Others, a series of arguments explaining that, while photo images of war atrocities bring to life the horrors of war, they need to be coupled with compassion. Without at least some interest in humanity, these pictures are just a vague reminder of the terrible things going on in the world. With everything that has been going on in Egypt, it seems like more pictures have been coming out of that country more than ever. The question is, does any of this penetrate the fog that the United States seemed to have wrapped themselves in? We try so hard to keep apprised of the goings-on in the world, but it always looks as though there is too much being thrown at us and therefore we become too desensitized. It gets to the point when I wonder if graphic images even work the way they’re supposed to, if they ever did. The only thing I can think of is how grateful I am that not the protests in Egypt were not as violent as they could have been. I was asked to compare two photographs, one as mentioned in Sontag’s book (someone needs to add pictures to the next edition) and one from the Egyptian protests. The following can be rather graphic, so I warn you now. It’s shocking and upsetting and no one should ever see. Friederich had hoped that if he could shock and disgust the world enough, that they would understand how incredibly horrible war is and maybe would stop themselves from repeating those mistakes. While those ideals never did really work out for him, he did do something important: he opened up people’s eyes so that they could see that war isn’t glorious. It’s painful and frightening, a place where nearly everyone dies alone, generally for a cause that won’t win, or that shouldn’t win. Since then, photographers have tried to capture the horror of the battlefield and as the images got worse, it seems as though the people wanted to believe it less. We inured ourselves to the atrocity and tried to keep going without a glance. Now photographers have decided to take a different tack, but there are many who still believe shock and awe are the best way to go. 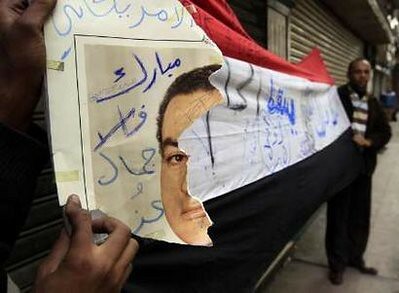 This is a simple picture of a poster of (now-Former President Mubarak) with a huge part torn out of his face. No where near as shocking as the above photograph, but still gets a very vivid point across. The protesters of Egypt don’t just want him gone, they want him obliterated. He needs to fall of the face of the planet where no one will ever find him again or they will get to him. This picture does less to show the atrocities of war and more to sort of give a preview of what could be to come. I find these pictures connected in their opposition: one tries to teach, the other threatens. Yet we still get a slight chill when seeing Mubarak’s destroyed face. 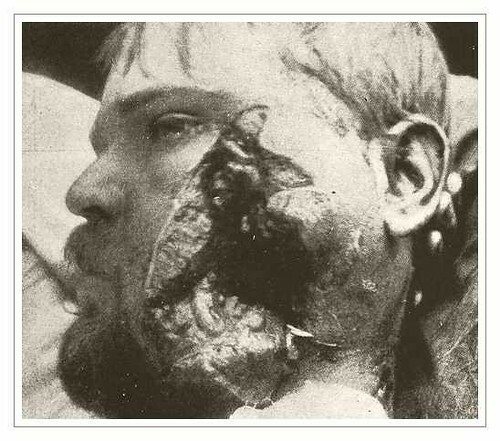 That we could actually see what is done to a person’s head only makes it worse. The only solace I, or anyone, can really take is that the number of casualties involved in the protests were minimal. There was no war, there were no bodies littered on the street to rot. A faithful few gave up their lives, but for the most part it is not as bad as it could be. So perhaps the second picture could actually show us that many have learned the lesson Ernst Friederich and Susan Sontag tried to teach. That images are powerful if used correctly, or are completely useless if overdone. It is unfortunate, in my opinion, that it took so long for that message to reach us. Next blog will be not so gross, promise!